Urban Ladder Home Décor Solutions Pvt. Ltd., which owns and operates Urban Ladder, has reported its latest revenue figures. 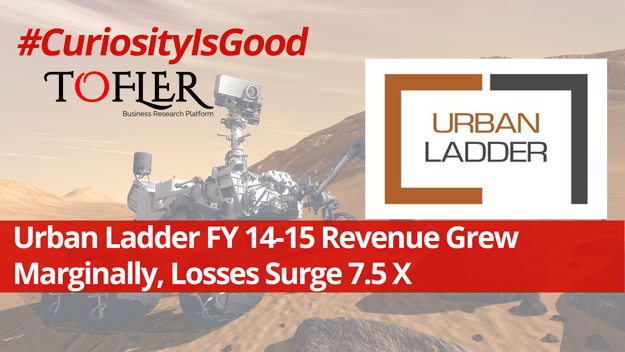 Urban Ladder’s operating revenue grew from INR 11 crores in FY 13-14 to INR 13 crores in FY 14-15, while the losses surged from INR 7.6 crores to INR 58.5 crores in the same period. Urban Ladder’s total revenue stood at INR 19.2 crores – INR 12.98 Cr from operations and INR 6.23 other income – in FY 14-15 compared to INR 11.9 crores (INR 11 Cr from operations) in the previous fiscal. Looking at their P&L, it appears that they have shifted from an inventory led model to a marketplace model during FY 13-14 to 14-15. Revenue from ‘Sale of furniture’, which contributed 74% of their revenue from operations in previous fiscal, was nil in this one. Total revenue from operations grew by only 18% this fiscal. A total ‘Other Income’ of INR 6.2 crores, was mainly comprised of the ‘interest income and income from sale of current investments’. The book value of the current investments stood at INR 300 crores as on 31st March, 2015. Following chart depicts their year on year revenue and PAT. The loss for the company grew to INR 58.5 crores in FY 14-15 as against INR 7.6 crores in FY13-14. While the revenue grew only marginally this fiscal, certain expenses saw a tremendous increase – Advertising and Marketing expenses (grew by a whopping ten times) and Employee expenses (almost quadrupled) – thus increasing Urban Ladder’s losses many folds. 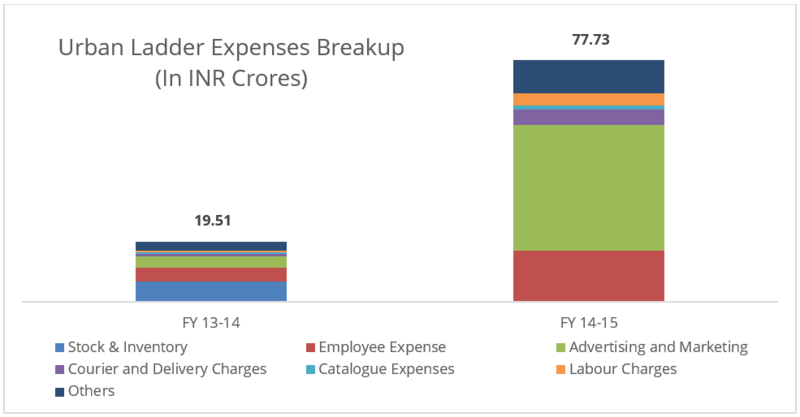 There was also a spurt in the Courier and Delivery Charges (from INR 81 lacs to INR 4.9 crores) and Labour Charges (from INR 58 lacs to INR 3.9 crores). The company provides free home delivery of furniture and free installation. Urban Ladder was co-founded by Ashish Goel and Rajiv Srivatsa in 2012. It provides an online marketplace for furniture and home décor and operates across 30 cities in India. It provides the service through the website as well as 3 different mobile apps. Its major competitors include Goldman Sachs backed Pepperfry and Rocket Internet backed FabFurnish. As per the documents available with the Registrar of Companies, so far it has raised around INR 460 crores from multiple investors including Kalaari Capital, Sequoia Capital, SAIF Partners, Steadview Capital, Anand and Venky LLC, Ratan Tata and Massachusetts Institute of Technology (MIT) among others. Urban Ladder was one of the early entrants in the online furniture retail space, which used to be a niche till a few years back. With a strong focus on quality, they are trying to build their USP on high end designs and great customer experience. With several established players and many more new ones coming in this space, battle is only going to get more intense.